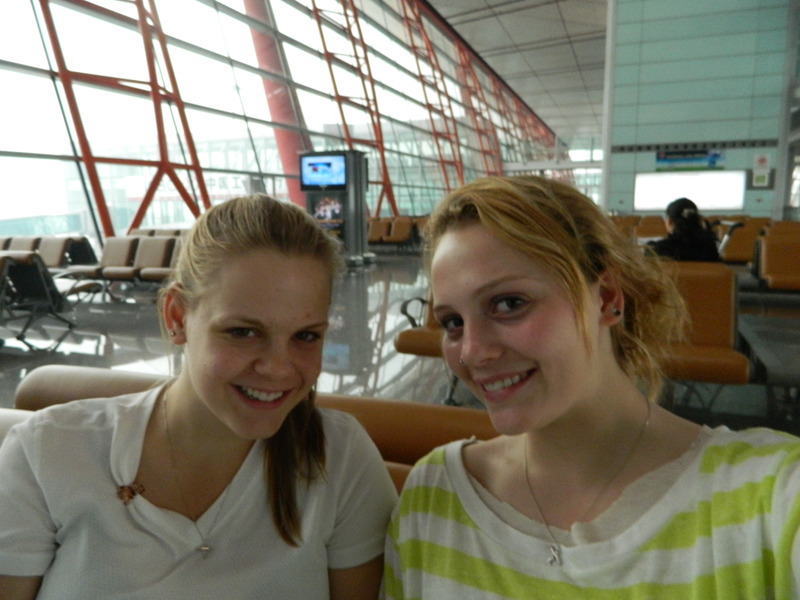 Alex and I in the Beijing airportAir in Beijing. Getting to Thailand is something that I an honestly say I would never want to experience ever again. All in all I travelled for a little bit under 48 hours, breaking once to sleep at Alex’s place in Vancouver and again for about 20 minutes on the plane from China. I started my trip on a shaky note from Chicago; waking up at six AM to a massive thunderstorm (with a prediction of severe thunderstorms persisting for the next two days) gave me an anxious start. Thankfully everything went without a hitch and my flight was not delayed. I flew from Chicago to San Francisco at two pm Chicago time and arrived in San Francisco around 4:45 PM west coast time. I was laid over there for another few hours and made it to Seattle around 9 PM. After my flights I took a four hour bus to Vancover, where I was met by Alex at the airport. The next day we flew out around 1 PM and made the painful ten and a half hour journey to China. We ended up sitting next to a very friendly Russian guy named Art, who had very entertaining views on the police (they’re manipulative and manipulatible), the government (corrupt), tea (better than and/or comparable to drug use), languages and various conspiracy theories (facebook is a means for the government to pacify and stalk the masses; unsurprisingly, Art can no longer be contacted via facebook). He managed to talk for multiple hour-long blocks and never seemed to run out of things to say. Although we enjoyed his company immensely, we were exhausted by his boundless energy (and the long flight) by the time we made it to Beijing. I’ve been told the air in Beijing was terrible, but it was even worse than I’d expected. Thankfully we didn’t have to go outdoors, because the only word that could really accurately describe it is terrifying. When we finally got to Bangkok we were ushered into a cab. Little did we know that this would actually be one of the most frightening experiences of our lives thus far. The driver’s mantra seemed to be “no seatbelts, no spedometer, no problem.” I think its safe to say that I’ve never been in a faster moving car in my life, and by a vague guestimate we were probably going between 85 and 110 miles per hour the entire time. Finally we made it to our hostel, which turned out to be lovely. There is a huge common area with mattresses on the floor for guests to nap and socialize on. The rooms are very clean and the attendants are all nice, and we have been having a great stay here so far.